Over the weekend my husband celebrated his 29th birthday. 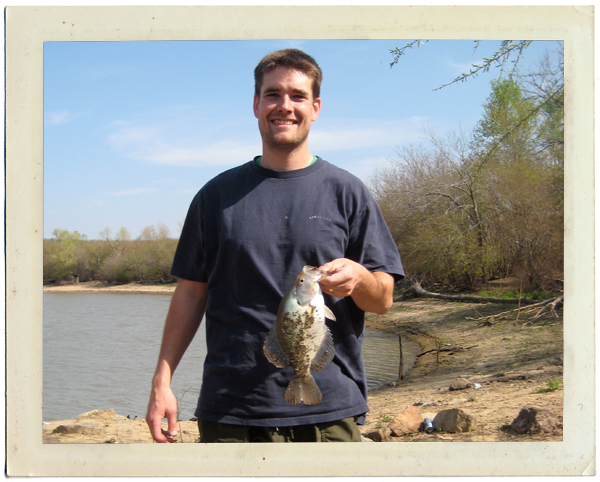 There was a lot of fishing, some hunting, a lot of eating and a lot of driving. Day 1: He went turkey hunting in Kansas. He calls the turkeys in and video tapes the hunts. [He makes fun of me for taking pictures of food, I make fun of him for recording his hunts.] Anyway, when he got home he wanted to show me the video of the hunt and realized the camera was still in Kansas! So, unplanned road trip back to Kansas to find the camera. Luckily, we found it on the side of a dirt road, a little dinged up from falling off the bed of the truck, but still working! Day 2: He went fishing in the morning so I went flea market shopping! I'll show you some of my awesome finds later. 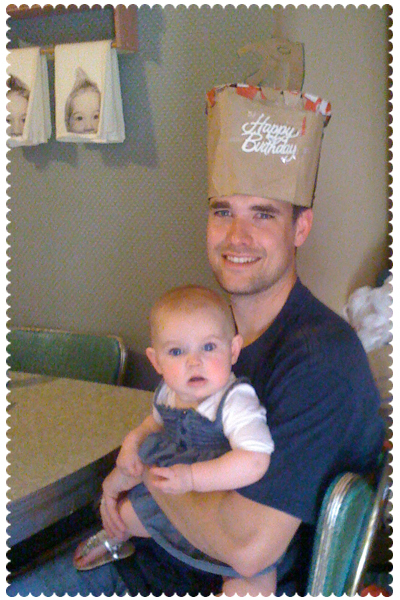 That evening we went over to my grandpa's where the nephews insisted he have a birthday hat. With careful instruction of what had to be included by the oldest boy, I made him a hat out of a paper bag, it said happy birthday and had the numbers on top. There were so many instructions from the oldest boy that it had me convinced birthday hats were a big deal at their house - not so. They just wanted to see their uncle in a goofy hat! Day 3: Time for our fishing trip. We went to the same place we went a year ago when I was largely pregnant. But, it was completely dry. The lake was down over 3 feet. Nuts! 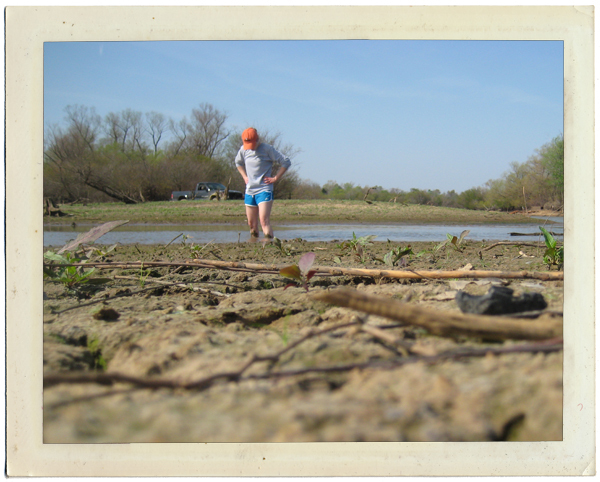 We found some water and decided to wade across a little stretch. I started sinking immediately. 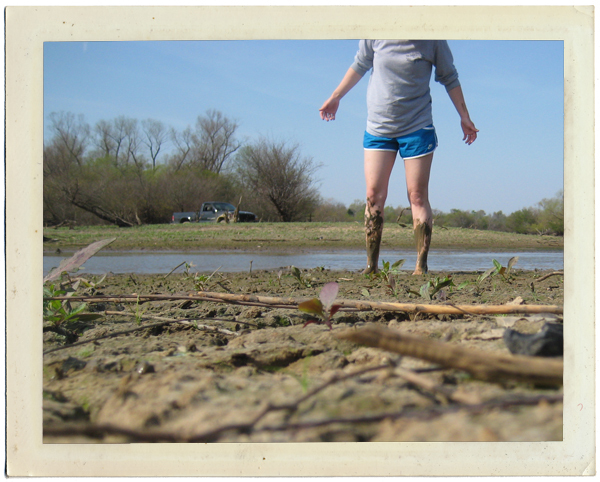 I had mud almost up to my knees! 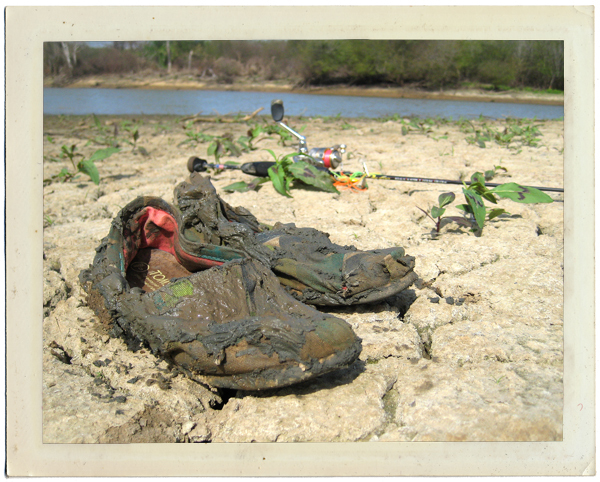 It was tough getting out and the mud tried to eat my shoes but I managed to pull them out! Speaking of TOMs, did you know today is a day without shoes? Check it out here. After all the mud, a nice slip and slide by me when I chased after my hat that blew away, we finally found some fish! We had a blast and by the end of the day I was a stinky mess. It was so weird just being me and the husband, without Sweet P (nana and pappy babysat her all day for us) we kept talking about her and how much we missed her. But, it was also so much fun to just be us again. 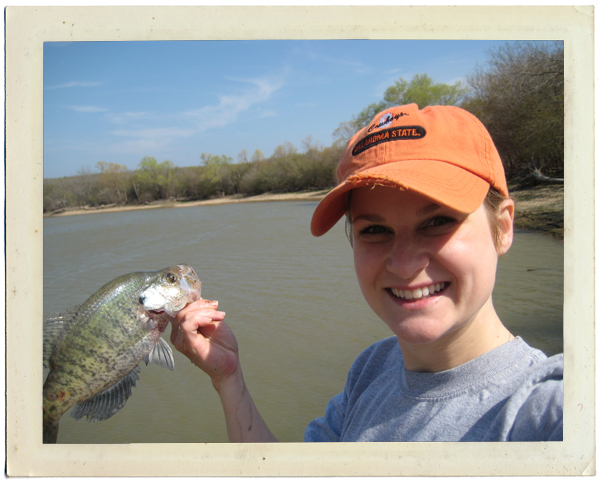 I will also add that lake fishing is much more enjoyable when you're not over 6 months pregnant! What a fun day! Our husbands could be bff's. Mine talks all of the time about how amazing it would be to just hunt for a living. That's awesome that you were able to spend the day with just the two of you! Happy birthday to your husby!! !